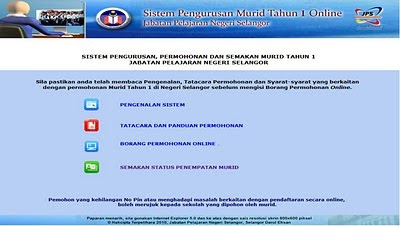 Alex Yap's Blog: How to register for primary school in Selangor? 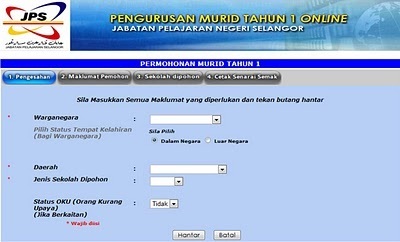 How to register for primary school in Selangor? 2 . Fill in the form, you will need your child MyKid card. 3. Pick a school from http://www.moe.gov.my/jpnselangor/jkict/indexTS.php, for instance I wanted to find school with name "Sin Ming". Make a note for the PPD and the school address. 4. Once you have successfully registered, you will be given a PIN. This is for you to login again to your registration to amend or check for status. 5. Remember to print out the completed form by clicking on "Cetak" at the bottom. Eligibility to register: Child is currently 5 years in that year. Meaning at most you can register your kid 2 years in advance. Some excerpt from what my wife say about me ... He is a black-and-white-only person. His motto? Wrong is wrong lah. Just as the sky can never be joined with the earth, his "right" will never have room for the "wrongs". A person with steel-like principles and overt confidence. Never failing to speak his mind, he will present the real him to you as-it-is. Often, he can be loud as a thunder, especially when his paper-thin patience is tested to the core. But you probably would notice too that he is a very thoughtful person. Paying attention to most of the teeny-weeny details, and showing the gentle side of him.